When it requires to count the tablets; say in multiples of hundreds, conventionally people use mesh type perforated trays with required number of holes on it. Tables are poured manually on this mesh and then slided to fall in a container. This entire process is manual, very slow, prone to human error, results in breakage of tablets. Basically a mesh is a tool and not a machine. Other Options available include machines that count tablets based on weight. But then, even this method is not accurate since there are small variations in weights of the tablets due to compression. Sensograph has successfully introduced a solution which overcomes these problems and which has already found acceptance in many countries. The system is based on Multi-track vibrating Mechanism with high speed non contact type sensing. This is fully automatic and ensures that each and every tablet is counted without human intervention. Typically 1,00,000 to 2,00,000 tablets are counted per hour depending upon count of each pack. * Depending upon the type of product & target weight. 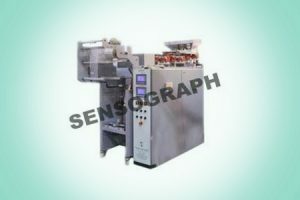 Massively used for packaging of plastic caps and rubber items, this Fully Automatic Counting Machine is manufactured in adherence to the predefined industry guidelines. Having inbuilt eye mark controller and full or half-cut count systems, the proffered machines are quite efficient and easy to operate.